You are currently browsing the tag archive for the ‘line laundry’ tag. I live by that phrase. I am perpetually late for most things in my life. Yes, most times it only five minutes or less but it’s still late. And so is this posting. Right now it’s because there isn’t much to talk about. The weather is still too hot to do much. And, as usual, the wind is not cooperating. Sunday was the weekly club fly. We have been seeing strong winds most of the week. 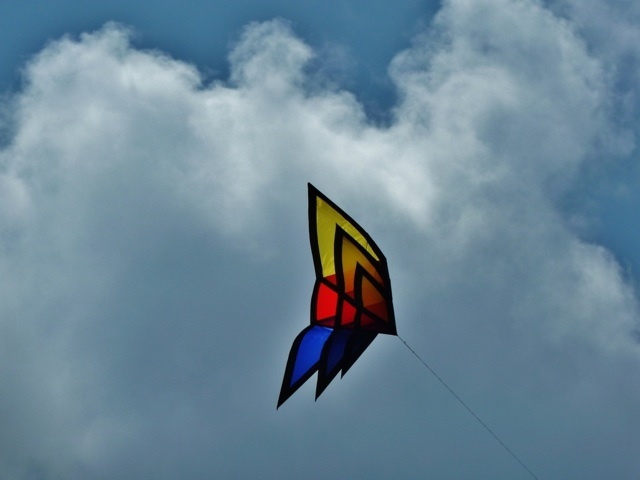 The forecast for Sunday was for winds to moderate and be at an ideal level for flying. Weatherman, can you ever get anything right? It was howling a gale out on the beach. There were a lot of people out that morning. And there were quite a few kites in the air. Most notably, a large Sutton with a banner tail and lots of line laundry hanging from it and a HQ Triangulation, also with line laundry. 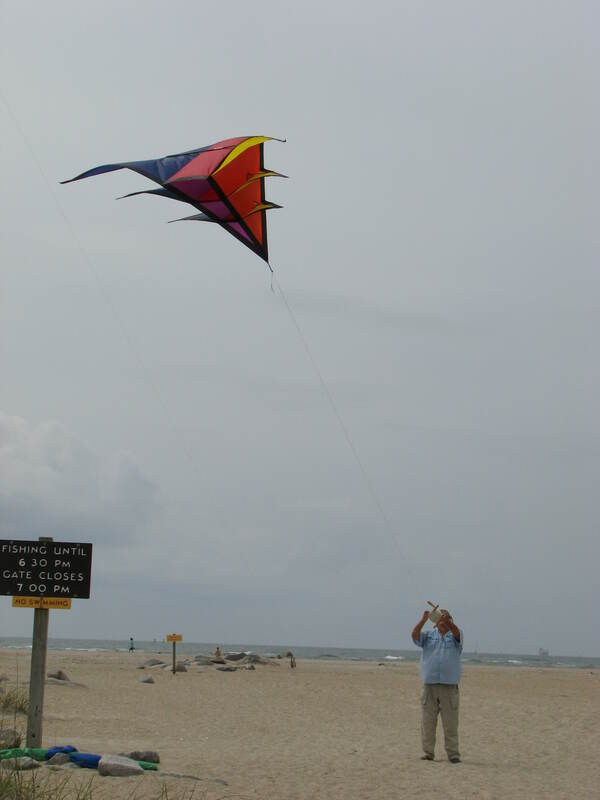 Most of us foolishly listened to the weatherman and only brought mid-range kites and didn’t want to risk damage in the higher winds. So we stood around a lot and talked a lot. The stronger winds did not stop the Revolution fliers. There were several vented Revs and Super Sonic Revs in the air. 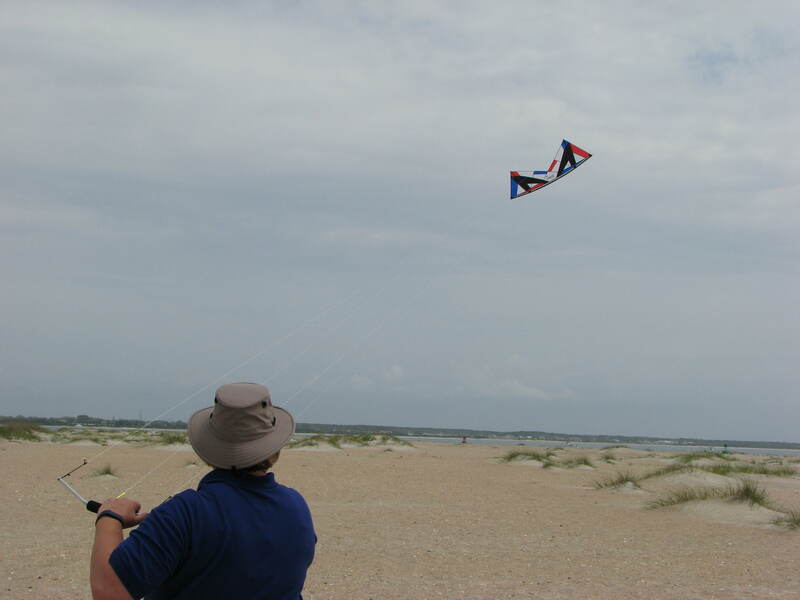 Now those kites are made for stronger winds and so they were flying great. And one flier was having a ball launching himself with a HQ Symphony. I think it was a Symphony 2.2 but I’m not sure. Anyway, the pull on that kite was so much that at times the guy was sitting on the sand and digging his heels in to stay close to one place. That’s way more that I want to handle. So after a while we picked up our bags and headed to the kite shop for more chit-chat. We did manage to fly one night this past week. About an hour before sunset, the winds seemed to be just right for some flying and it was starting to cool off some. I tried to put up the Goblin stack I had just put together. No luck. There wasn’t enough wind to launch the three-stack. Rats! But I did bring along the Nebula. I hadn’t flown it yet and was looking for a good opportunity. That night was the night. I took off like a dream. No pull. Very responsive. I tried a couple of “push” turns and it was fantastic. Sharp turn, no oversteer and straight tracking. I still need practice with those type of turns but it was so easy. I even managed a square in the sky. OK, so it was more like a lop-sided rectangle. But that was the closest I’ve ever come to completing that manuever. There is hope for making me a precision flier. Sweet kite, that Nebula. It was dark by the time we left the beach. Oh. for more evenings like that one. 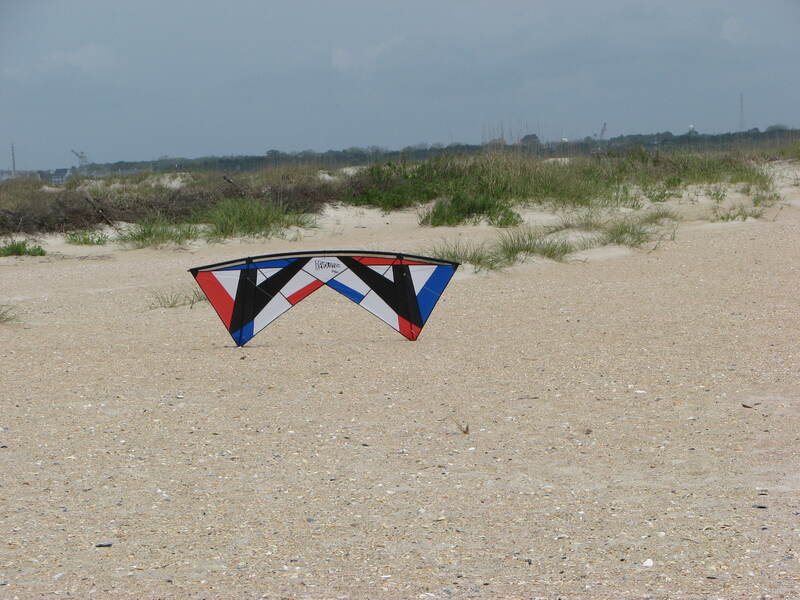 Sunday was the weekly club fly at Fort Macon. Quite a few of the usual suspects were there. 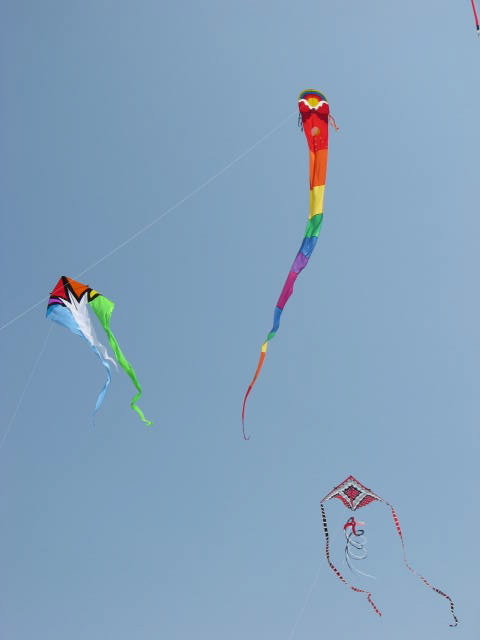 It was a gorgeous day with great winds for all types of kites. 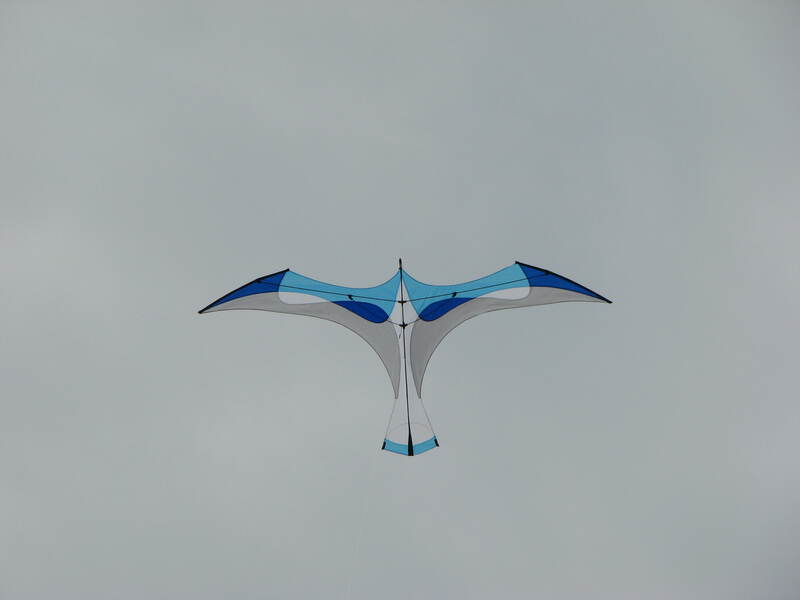 And we had kites of all types in the sky. One of the better shows in the past few weeks. I put up my mesh delta with the transition tails and spinner. It’s been a long time since I’ve flown that kite. I also put up a White Bird dragon. I used to fly at least one of these every time I flew but had gotten out of the habit. Time to renew this habit. My husband put up his early Father’s Day present, the very colorful Flo-tail Delta by Premier. 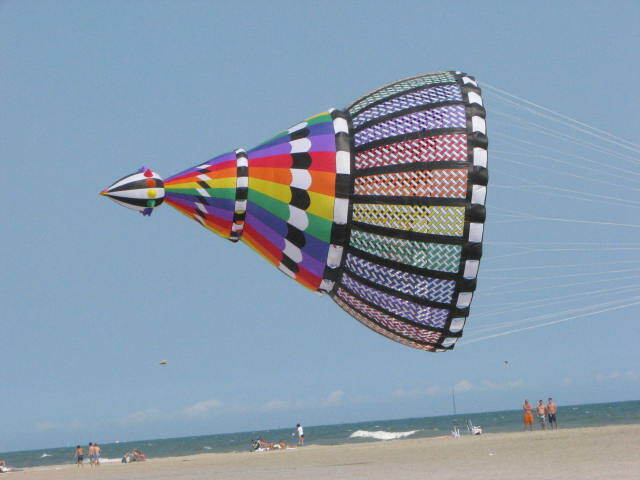 It is one beautiful kite with a lot of pull. 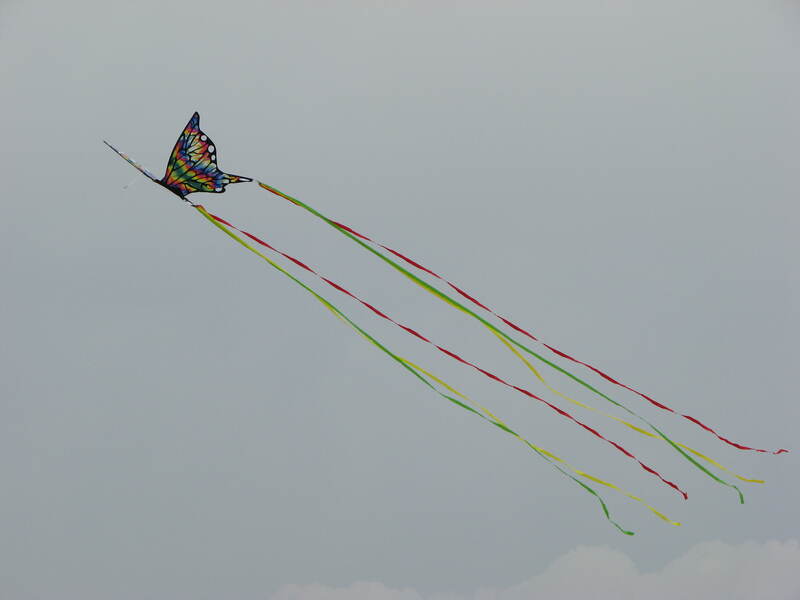 There weren’t a lot of stunt kite fliers present but I did get some practice with the quad lines. First, I got a chance to fly the Volksquad by New Tech. It was a very short flight. Before I could get the kite balanced and a feel for how it flies, one of the bungy cords on the sail snapped. That was the end of my test. With no tension on one side of the sail, the kite came tumbling down. 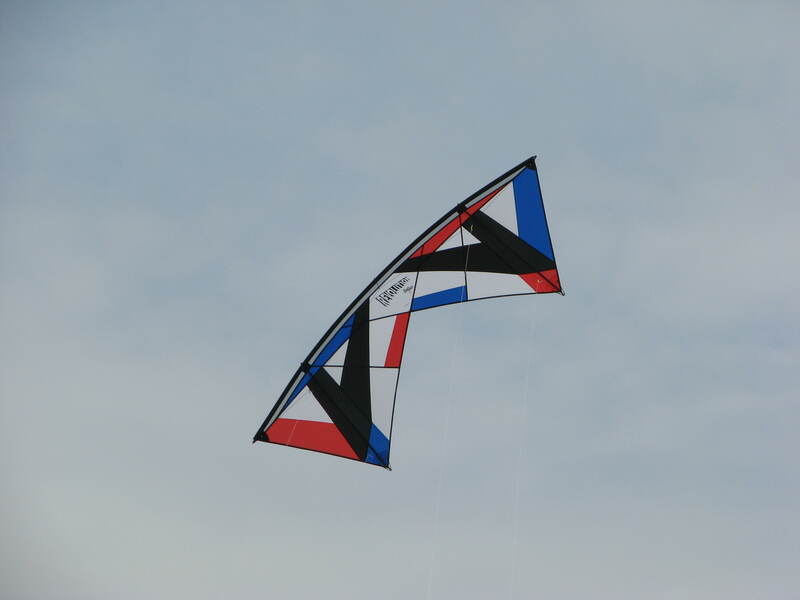 I will probably hear about “breaking” the kite for quite a while. At least I won’t have to fix it. 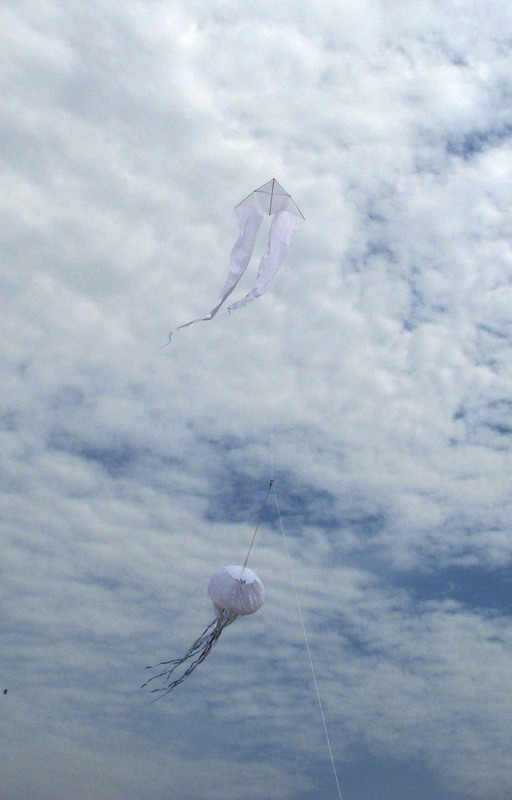 It was a tester from the kite shop. 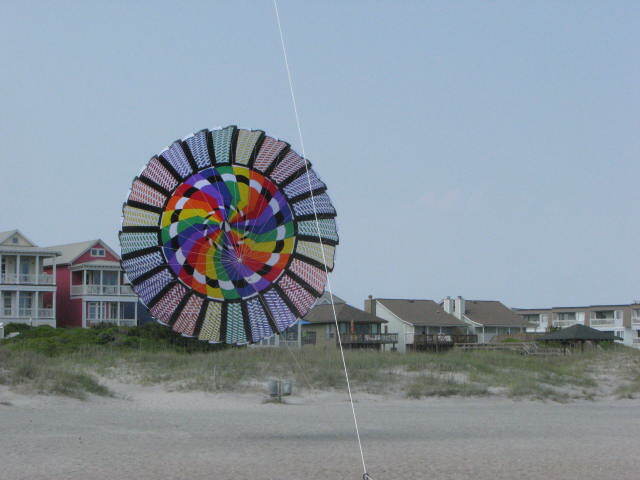 However, It may be a while before I get to try out a new kite again. Later, I put up my Vamp Devil. Flew it for a while and then stopped for a some water. I highly advise everyone to mark their quad line handles so you can tell right from left. I haven’t and when I picked up the handles again, I got them reversed. The end result was a mess of tangled lines. 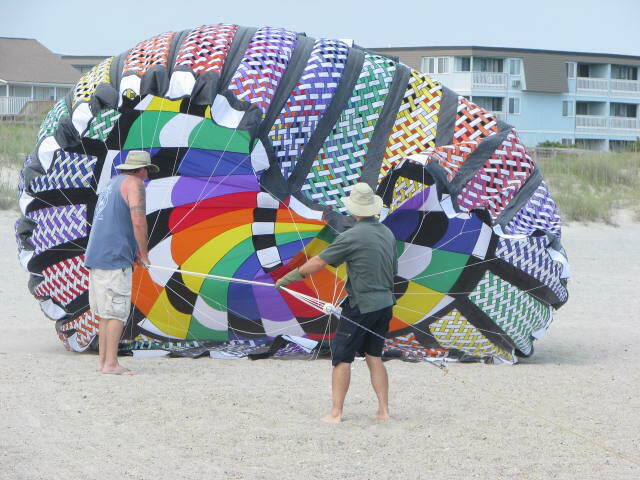 It’s no fun to have to spend the end of your kiting day untangling lines so you can wind them up and put them away. Not my morning. The day got better, however when we were invited to join some friends on the beach for more kite flying and good company. 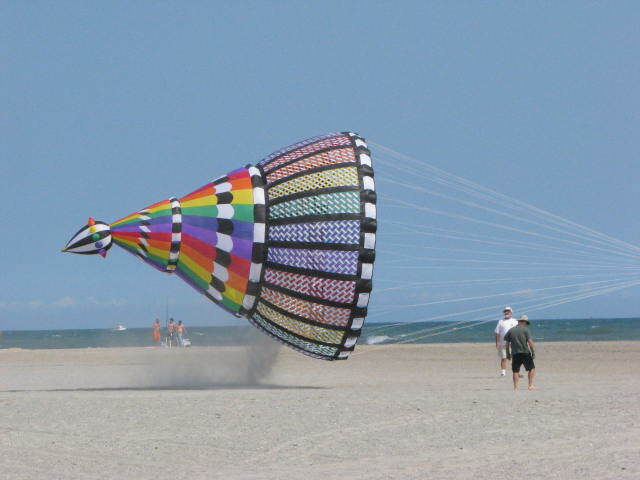 Someone had been flying on the beach in front of their house and the kite-flying gauntlet had been thrown down. It would be an afternoon of big kites and even bigger line laundry. 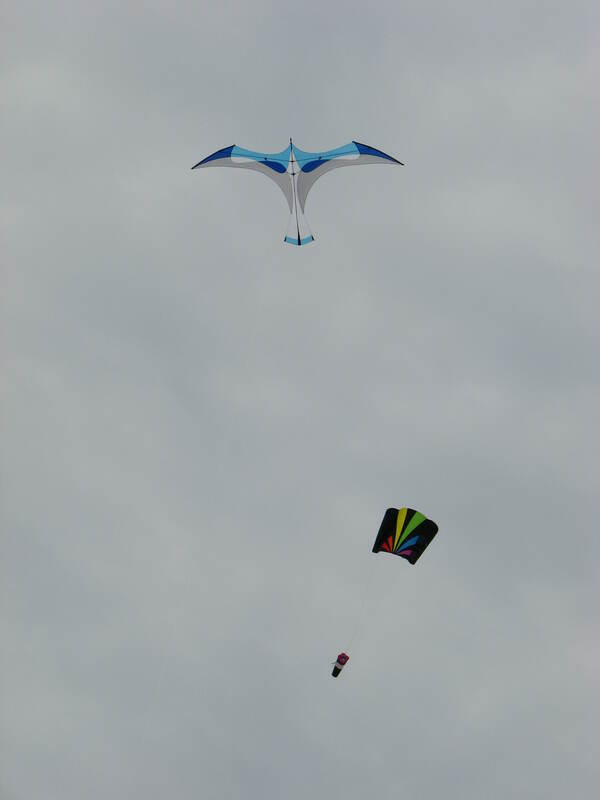 We took two of our biggest kites to fly. And out friend had a huge Premier spinner to try out on his large Sutton. 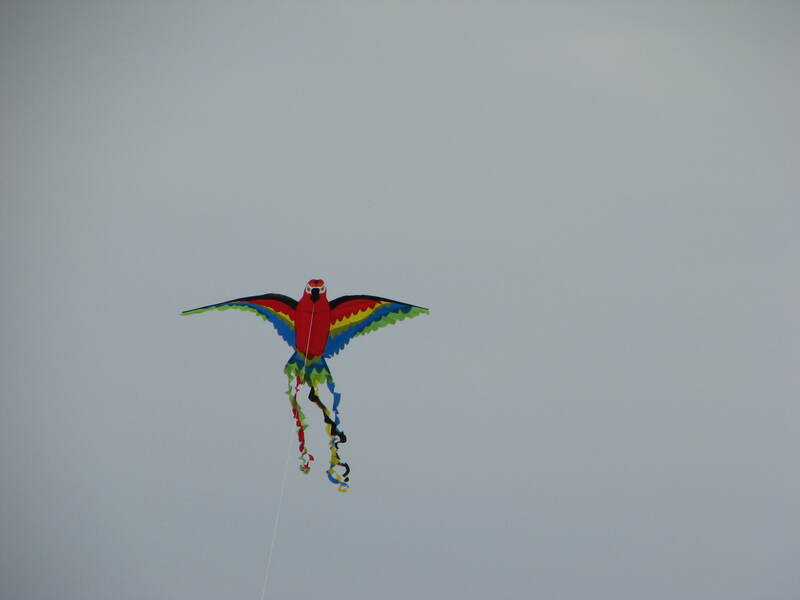 The winds had picked up from the morning and it was a perfect kite flying day. Before we arrived, the spinner was put up. And it broke the heavy line it was attached with and straightened out a large swivel. 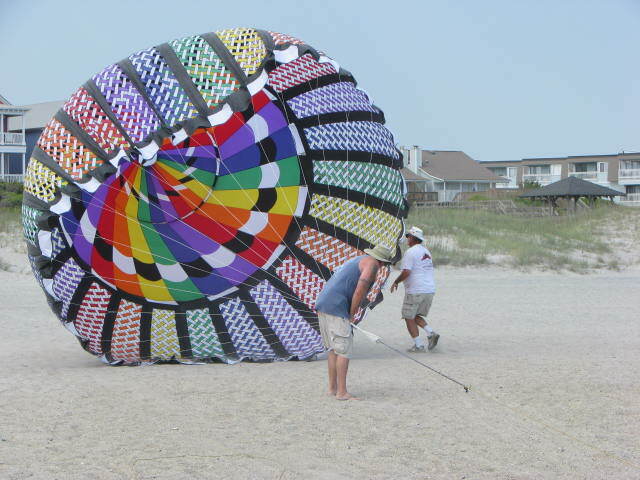 We missed the show of our friends running across the beach trying to get the spinner deflated and safely grounded. The call went out for a heavier line and swivel. 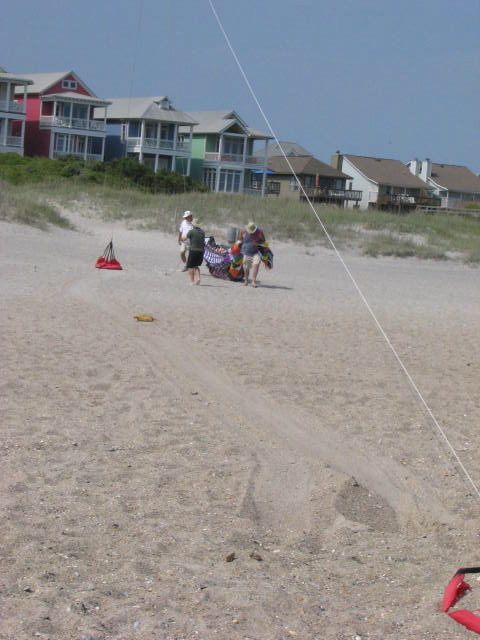 Our local kite shop owners came to the rescue and brought over the line and swivel after the shop closed for the day. The guys put up the spinner while the gals visited and supervised. 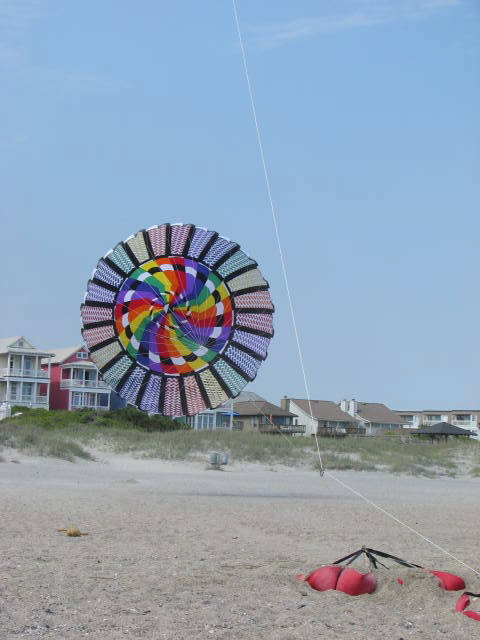 The first attempt resulted in the sand anchors being pulled down the beach as the spinner caught the wind. It was gorgeous, but the pull was tremendous. Not to be defeated by line laundry, the anchors were re-buried and the spinner was put up once again. 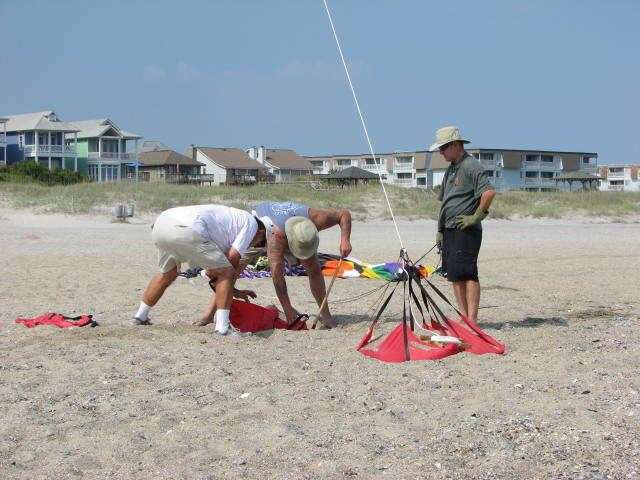 The spinner was a great show on the beach and drew a small group of people to watch the launches and the flight. When, once again, the anchors started to be pulled out of the sand, we quit and brought the spinner down. It went home to the kite shop and we enjoyed the last of the afternoon sun. Thank you, LeeAnn and Bob, for the invitation and the great company that afternoon and evening.